This review first appeared in the May 2-3, 1998 issue of the American Reporter. No grand thoughts here, no secrets of the universe or explaining relationships or politically correct handwringing. Nope. 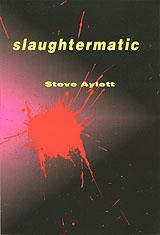 With Steve Aylett's new novel, "Slaughtermatic," style is substance. When writing about "Slaughtermatic," one is strongly tempted to dip into such overused modifiers as "crackling" or "rapid-fire." Only those words have been used so many times with so many other works, damned few of which are anything at all like this one. "Slaughtermatic" is manic in its pace  and yet pace of what? There is no storyline to speak of; this work of fiction is so utterly surreal that the story finally becomes irrelevant to the reading. What we're left with is a work where the pace is in the act of reading. But if the story is nearly impossible to follow  intentionally so, it would seem  the book itself is one of the more fun reads out there. Aylett is being compared to J.G. Ballard  which is fair, if you're talking about Ballard's sci-fi noir, books like "Crash," "Drowned World" and "Concrete Island." Only Aylett is much more into word play than Ballard. But like Ballard, Aylett uses a frantic syllabic rhythm and free-association modifiers to create a sense of surrealism that then allows him to create the absurd. "On a couch sat Costello, discussing dialist subcontinuism and drinking a Reaction takeout entitled Counterfeit Reality Strain. He called Dante Two over for support. Costello had been given six months for crucifying a Valley Girl and everyone was boasting that if they'd been allotted that much time they could have crucified fifty. Now he belied his exopose (sic) by discussing the annihilative dangers of attempting to purify a thing which consisted entirely of impurities." Aylett also has a nice touch at creating memorable character names  they're pseudo-classics, like Dashiell Hammett on acid. Instead of Sam Spade and Joel Cairo, we get Dante Cubit, the Entropy Kid and Rosa Control. So what is "Slaughtermatic," besides being a gas to read? Well, the world Aylett creates here is definitely of the nightmare variety, and definitely a modern one at that. The traditional fear was of an omnipotent god or satan who could demolish the world. The contemporary fear, illustrated nicely by Aylett, is that there is no one in charge of the universe; that we're it in all our incompetent glory. But don't let the dark take on reality keep you from reading what is a very good book, even if it's difficult to describe.